Mac OS X Lion Wallpapers contains unofficial set of 19 Wallpapers. These were in Developer Preview 4 and all are of high resolution. 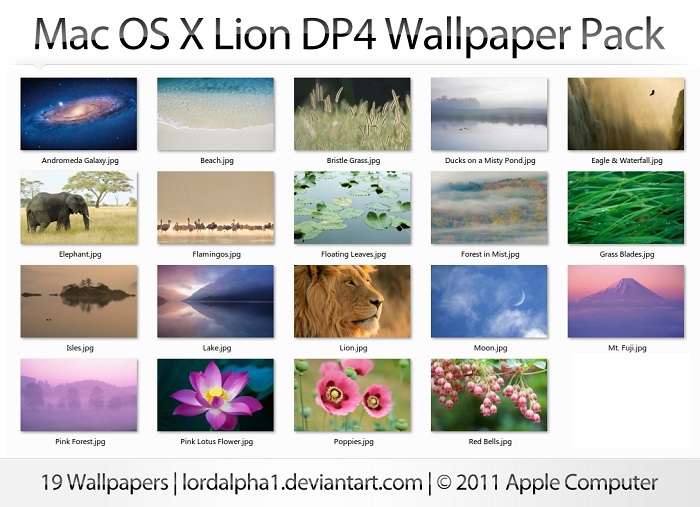 Mac OS X Lion Wallpapers set is of Apple Inc., this is compiled by lordalpha1. License : Mentioned by lordalpha1 as Creative Commons Attribution-Noncommercial-No Derivative Works 3.0 License. We are not hosting any wallpaper / download on our server. It is linked to deviantArt’s server. It is a ZIP download, 40.2 MB in size. This Article Has Been Shared 3978 Times! Pink Flower Wallpaper is an excellent quality Photo manipulated minimalistic pink floral Wallpaper for your desktop. Colorful Iguana Wallpaper is an excellent quality photo manipulated wallpaper of Iguana. Iguana is a herbivorous genus of lizard native to tropical areas. Dreamland Wallpaper is an excellent quality Photo wallpaper of a blooming Flower with amazing details. Bureaucratic Machine Wallpaper is an excellent quality digitally rendered fantasy wallpaper. Cite this article as: Abhishek Ghosh, "Mac OS X Lion Wallpapers – Unofficial set of 19 Wallpapers," in The Customize Windows, November 30, 2011, April 25, 2019, https://thecustomizewindows.com/2011/11/mac-os-x-lion-wallpapers-unofficial-set-of-19-wallpapers/.